Seven people had to leap to safety when a blaze broke out at an Indian restaurant. 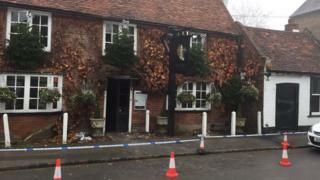 Police and fire crews were called out to the fire in Maliks in Cookham High Street, Berkshire, at 01:45 GMT. The people living above the restaurant jumped out of windows on both first and second floors to escape the fire, which is being treated as arson. One man in his twenties was taken to hospital with leg injuries and the others were treated at the scene. The injured man has since been discharged.